Mohammad Tareq and Mohammad Bahaa Al-Jabari, age 8 and 9, were detained on 24 September. Photo EAPPI/T. Fjeldmann. As an EAPPI accompanier in the West Bank city of Hebron, you quickly get used to many occurrences that never would be tolerated in your home country. Perhaps the hardest thing to get used to is the arrest and detention of children. During our two months here, the EAPPI Hebron team has witnessed several child detentions – we have also heard about numerous other such incidents from fellow international human rights monitors stationed in the city. Children are most often detained on their way to and from school, but are also taken from their homes in the middle of the night. Mohammad Tareq and Mohammad Bahaa Al-Jabari are 8 and 9 years old. We watched them being detained close to their school on Wednesday, 24 September. On the same day, we also witnessed the Israeli military driving past and stopping the boys outside a shop close to the same school. We know from testimonies of soldiers serving in Hebron that their key task is to make their presence known – stopping children on the way home from school is just one example of this duty. “They were throwing stones, so now we have to take them to the police station. There their parents can pay a fine to get them released,” – a soldier told the observers upon arrival to the site of the detention. According to the boys, the soldiers had also been rough in their treatment. “A soldier grabbed my face tightly when he wanted me to confess to throwing stones,” one of the boys described. The boys were taken away in an army vehicle to a police station close to the Ibrahimi Mosque, accompanied by one of the boys’ father. According to the boys, the father wasn’t allowed to speak to them. The boys were found innocent and released a couple of hours later, without the parents needing to pay a fine. Picture of 12-year-old Yousef Hajajreh, who was arrested on 8 September. Photo EAPPI/N. Forsstroem. The detention of children is strictly regulated in international law. In spite of this, Israeli authorities routinely arrest children, and is the only country in the world that systematically tries children in military courts, according to a 2013 UNICEF. 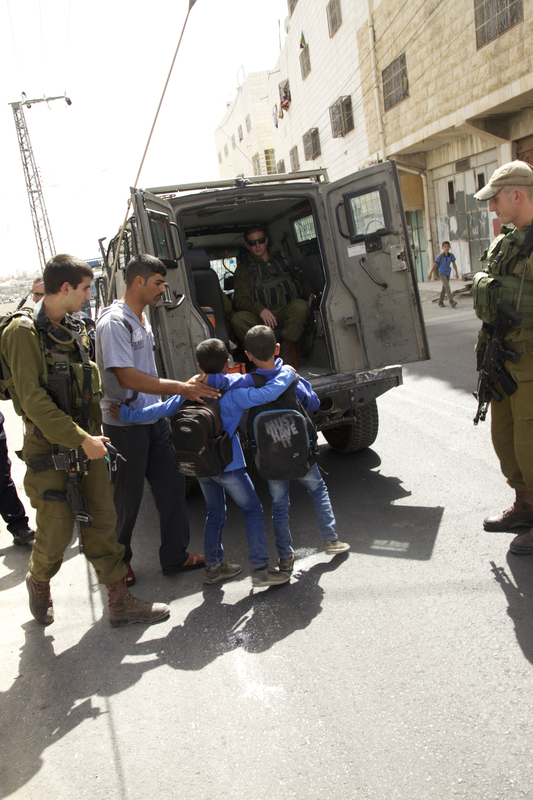 In Hebron, at least 41 children and 5 teachers were arrested in 2013 by Israeli forces [PDF – Page 6] on their way to or from school in H2, and in July 2014 as many as 192 children were detained by the Israeli military. Consistent with the Convention on the Rights of the Child, children should be restrained only if they pose an imminent threat to themselves or to others, when all other means have been exhausted, and only for as long as is strictly necessary. Detention is a traumatic experience for children, regardless of its duration, according to a report from Save the Children in 2012. The research shows that detention has an affect on the psycho-social well being of the child, as well as the parents. This can go on to have a profound impact on the child’s future, especially on their education and career. *Read more about the affects of the Israeli occupation on Children. 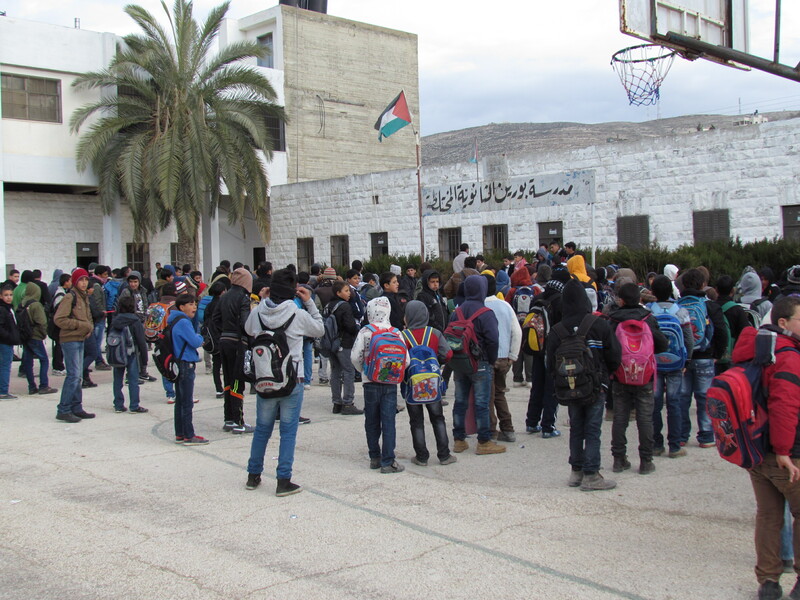 The situation at Burin secondary school in the Nablus district is escalating, adversely affecting the students access to education. 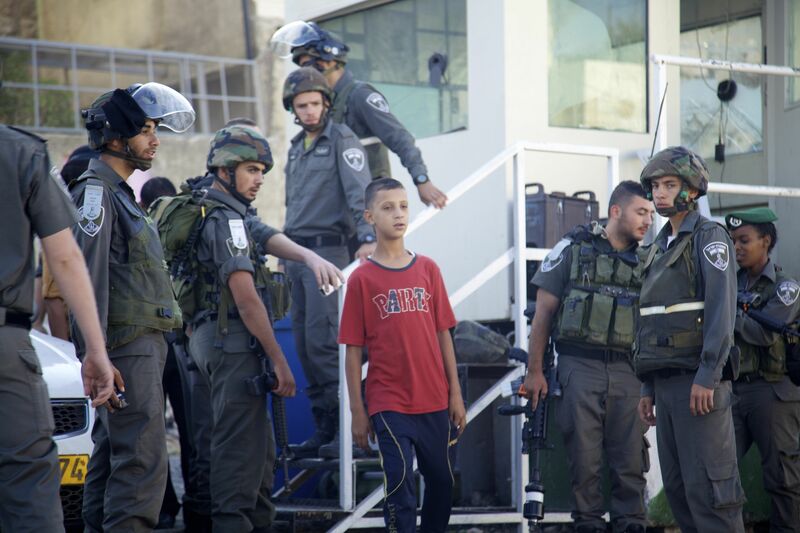 The presence of Israeli soldiers and settlers often result in clashes with the school boys. Despite all, one girl stands out as an inspiring model with hope for the future. In Burin, the school begins with the national anthem as in all Palestinian schools. Photo EAPPI/T. Kopra. One of the most rewarding and important tasks for Ecumenical Accompaniers (EAs) is to do “school runs” that enable Palestinian children to arrive safely at school each morning. School runs are a part of an Access to Education initiative supported by UNICEF which aims to guarantee children’s access to education despite the hardships of the Israeli occupation of the West Bank. One of the schools we visit weekly is the Burin secondary school. 285 students study here, 25 of them are female. In recent weeks the situation between the students and the soldiers outside the school grounds, only some 50 metres away, escalated several times. Israeli soldiers park their jeeps behind the school each day claiming to protect the Israeli settlers using Road 60, about 200 metres away from the school. 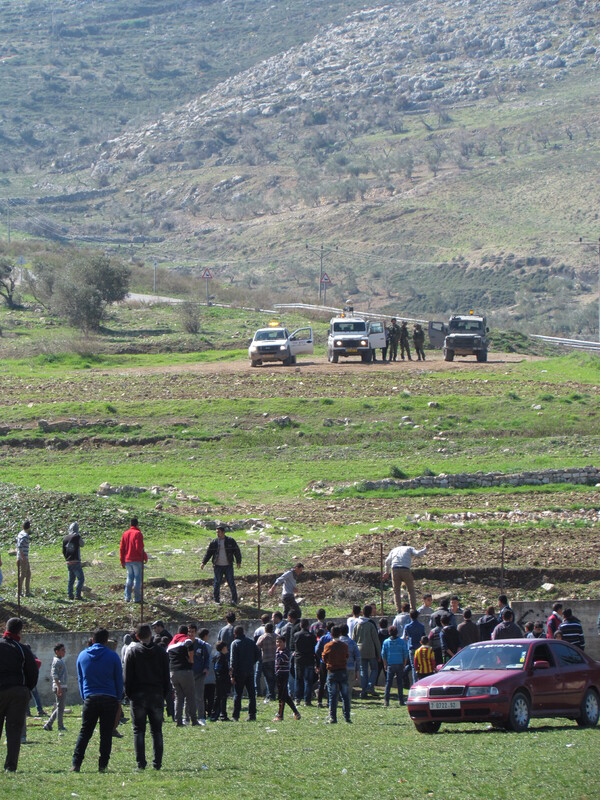 Settlers from the Yizhar settlement, located on a hill top behind the school, and soldiers often accuse students from Burin of throwing stones at their cars. At times the soldiers get out of their jeep and walk very close to the school yard during the lunch break. Sometimes the head of security of the Yizhar settlement accompanies them. The Israeli soldiers are often accompanied by the security staff of the close by Yizhar settlement in their white jeeps. Photo EAPPI/T. Kopra. The presence of the settlers particuarly provokes the students who start shouting and gather at the school fence. Sometimes the boys throw stones, which causes the soldiers to respond with tear gas and sound bombs. Sometimes the soldiers also enter the school yard to intimidate the students, or set up a flying checkpoint just outside the school gate when it’s time for the students to go home. They detain the boys and check their hands in order to find out if they have thrown rocks. They also search their school bags and keep them waiting for long time before they can go home. Incidents like this have a huge effect on the education of the students in Burin secondary school. Hyped-up by their encounters with the soldiers, the students are not able to concentrate on their studies in the classroom. Teachers at Burin secondary school tell us it has become increasingly difficult to control the students or to get them to pay attention during the lessons. This particularly affects the boys. “The boys want to fight the occupation, they want to fight the soldiers”, says Ghassan, a local activist, who graduated from the Burin secondary school some years ago. “They don’t understand that the best way to fight the occupation is to get an education,” he sighs. Yasmeen al Najjar is one of the first palestinian women to climb Kilimanjaro in Tanzania. “I can’t climb to the hills here in Burin because of the soldiers and the settlers, but I can climb a mountain in Africa,” she explains. “It shouldn’t be like this.” Photo EAPPI/T. Kopra. In the midst of the chaotic everyday life of Burin school, we meet one of the most inspiring people that we have met during our time in Yanoun. 17-year-old Yasmeen Al Najjar, a student, just returned from a trip in Africa. This bright young woman climbed Kilimanjaro in Tanzania in just eight days. A remarkable achievement for anyone, let alone for a young woman who wears a prosthesis on her left leg. 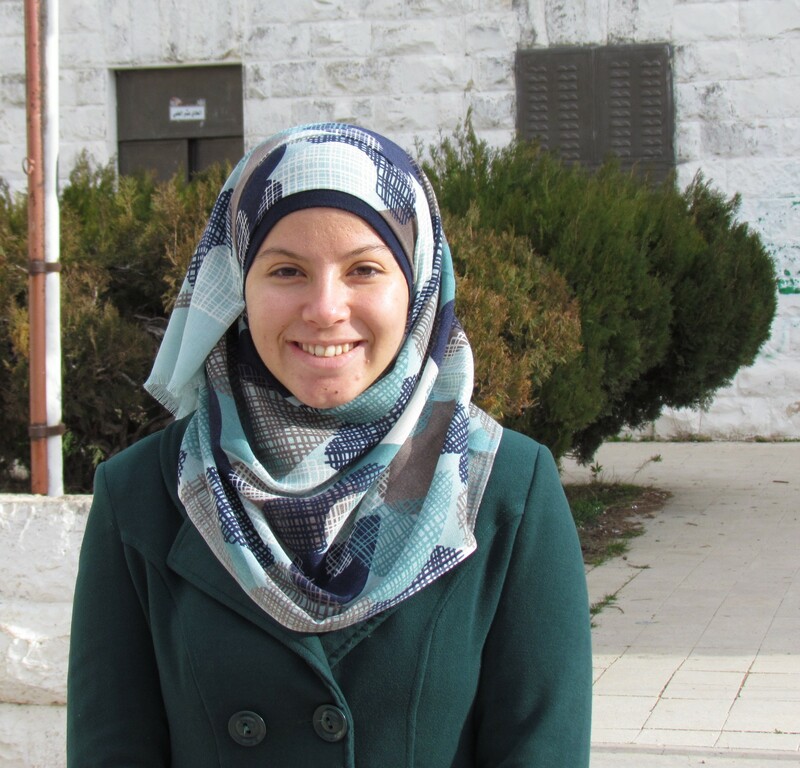 Yasmeen took part in an expedition as a member of Palestinian Child Relief, an organization focusing on helping handicapped children in Palestine. Now the whole school looks up to her. We meet her on a morning when she received an award for her remarkable achievement. When we ask her, what does she think of the soldiers parked outside of her school every day, she emphasizes that all children have the right to study in peace. She feels that the Palestinian students are not in an equal position with their peers in Israel or in other countries. Israel signed and ratified the UN Convention of the Rights of the Child, which expects all signatories to “take all feasible measures to ensure protection and care of children who are affected by an armed conflict” (Article 38/4). As an occupying power, Israel must guarantee equal educational rights to Palestinian children.